If you're new to document binding, or maybe just switching gears to try a different binding method than normal, and you run into the word "pitch" to find yourself a bit confused over the meaning...you're not alone! One of our most frequently asked questions is simply, "what is a binding pitch". So let's get straight to the answer, shall we? A binding pitch refers to the spacing between the holes, which translates to the spacing between the prongs of your binding spine. The pitch is written in a ratio format with a number, a colon, and a second number. For example, 4:1 which reads "four to one". The first number is the number of holes while the second number is the measurement, which in the USA is "inch". So 4:1 indicates that the binding and hole pattern has 4 holes for every 1 inch of length. What is not shown in the above infographic is that there are sometimes even more options within a specific pitch. For example, 4:1 for spiral coil binding can come in either a 4:1 0.248 or 4:1 0.2475. This indicates the space between each individual hole, but is such a minor difference that it doesn't affect compatibility with any of the 4:1 coil binder spines. This is usually used in larger facilities such as print shops, and is an indicator of a punching die that goes into the machine. The tiny difference in spacing can make a helpful difference when it comes to inserting the coil through the holes. But all of this is a bit more involved, so let's talk about it in a different post. So now that we have a better understanding of what exactly is meant by a binding pitch, we can review the different pitches available for the different kinds of bindings...because some bindings have multiple pitch options, which may require multiple punch machines or expanded capabilities of some kind. This guide will help you choose which binding pitch you should choose before you buy a document binding machine or binding spine supplies. First off, you need to understand that in order for them to be compatible, the pitch of your binding machine needs to match the pitch of the binding spines too. This means that your 3:1 wire binding punch will not work with 2:1 pitch wire bind spines or 4:1 pitch spiral coil binders...it is only compatible with the corresponding 3:1 pitch wire bindings. So because the pitch will be a determining factor for compatibility, you need to be sure that the pitch of your punch machine matches the pitch (and binding style) of your binding spine or supplies. So now let's take a look at some of the most common binding methods that use pitch as a measurement for their hole spacing, and see the various pitch options available for each. You can see that the number format of pitch is primarily used for plastic coil spiral binding and wire-o twin loop binding. 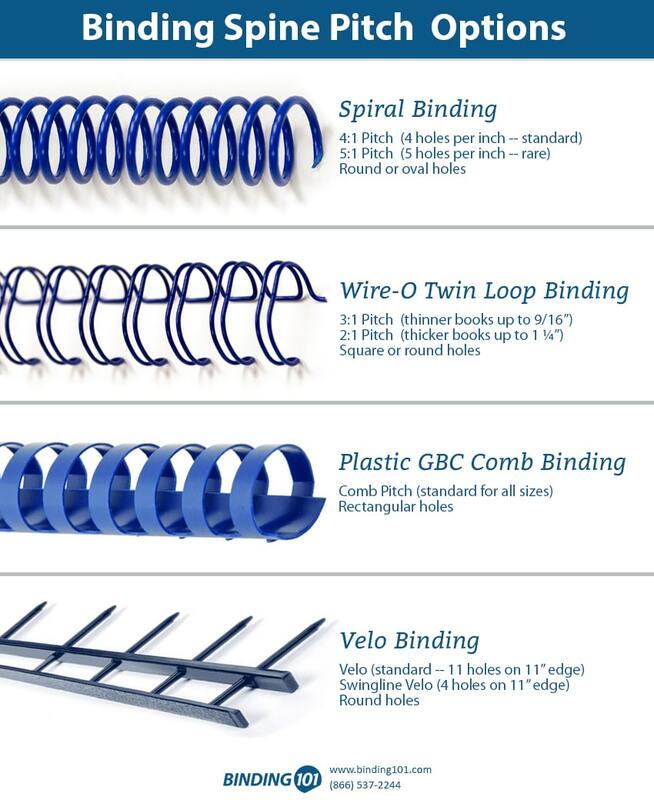 Comb binding and velo binding use slightly different terminology. So there you have it! A pretty detailed description explaining what a binding pitch is, and why it is an important consideration when you are choosing your document binding machine and binding supplies. If you have any questions or need more guidance, please call our team at (866)537-2244 (866)537-2244 or email us at info@buy101.com.